1000-meter resolution GOES-08 and GOES-12 visible imagery (above) shows the extent of pack ice that had begun to increase on Lake Superior during mid-late February 2003, when colder than normal temperatures were experienced across the western portion of the Great Lakes region. The newer GOES-12 satellite's visible channel data showed the ice pack with greater clarity, due to degradation of the visible detectors in the older GOES-08 satellite (which was launched in 1994). 500-meter resolution Terra MODIS RGB composite imagery (below) shows the lake ice in further detail (a result of better spatial resolution), and also demonstrates how the use of multi-spectral imagery helps to distinguish the ice features from any areas of cloudiness that were present on various days. The channels 01/06 composite images show clouds as bluish-white, with snow/ice having a pink/red enhancement. Larger versions (1.3 MB file size) of the 17 February, 07 March, and 22 March Terra MODIS composite images are also available on the SSEC MODIS Image Gallery. 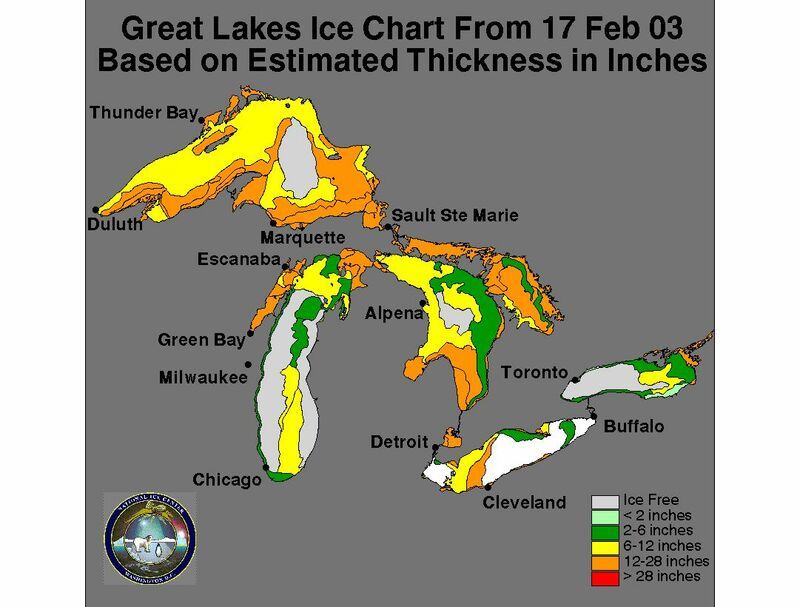 The extent of the lake ice began to increase again after a few days of very cold temperatures -- overnight minimum temperatures on 25 February included -36 F at Tower MN, -34 F at Upton WI, and -29 F at Marquette MI. 250-meter resolution MODIS composite images are also available from 28 February, centered near Bayfield, Wisconsin and Houghton, Michigan. The ice continued to thicken during the record cold temperatures experienced in early March -- on 03 March it was -42 F at Ewen MI, and Marquette MI dropped to -30 F, setting a new record low for the month of March. Minimum temperatures on 05 March included -39 F at Tower MN, and -29 F at Clarksburg and Mohawk MI. 250-meter resolution MODIS composite images are also available from 05 March, centered near Bayfield, Wisconsin and Houghton, Michigan. The ice continued to thicken as record cold temperatures persisted -- minimum temperatures on 06 March included -26 F at Marquette MI and -32 F at Clarksburg MI. 250-meter resolution MODIS composite images are also available from 07 March, centered near Bayfield, Wisconsin and Houghton, Michigan. Despite several days of record warm temperatures in mid-March (high temperatures in the 60's and 70's F across the Great Lakes region), a significant amount of ice remained in Lake Superior.